Three Reasons Old Testament Reading Is Fun . . . Really! The Old Testament has a bad wrap. People often skip right over it and go straight to the “good stuff” of the New Testament. 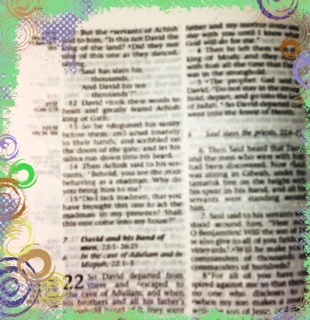 But, I’ve got three of I’m sure many reasons to find fun in reading Genesis to Malachi. Give me five minutes, and see if I can’t give you a more positive view of God’s word than you may have held once before. What we call the Old Testament is the Bible Jesus read! At the time that Jesus walked on the earth, the only Bible that existed was what we now call the Old Testament. Christ’s death and resurrection is what created the New Testament whose name we have applied to the part of our modern-day Bible beginning with the Gospels. When Jesus unrolled the scroll and read in the Temple, He was reading from the Old Testament book of Isaiah. When He spent time speaking with the priests of the Temple, He was discussing the Law, the Prophets, and the Writings (which was the way the books were arranged at that time). The Laws that Jesus refers to in His parables come from the writings of Moses. John tells us that “In the beginning, was the Word,” equating Christ to the Word of God, and underscoring the first-hand knowledge that Christ has of what we call the Old Testament. Philip Yancey has written an entire study of this reason, aptly titled The Bible Jesus Read. The science and history that backs up what the Bible says. Don’t let your school textbooks or cynical college professors fool you. Real science and artifacts exist that back up what the Bible says. A good place to start exploring these truths is the website Reasons to Believe at reasons.org. If you are a DVD fan, I can recommend three series that explore the science and history behind the Bible, especially the Old Testament, really well (thanks to my friend and life-group member, Roger Jay! ): If God Made the Universe… based on the work of Dr. Hugh Ross and TrueU: Does God Exist? Building the Scientific Case & TrueU: Is the Bible Reliable–Building the Historical Case . . . both based on the work of Dr. Stephen Meyer. These DVDs do a much better job than I could in making the case for faith, so to speak. Also, I have an “Archaeological Study Bible” that is full of articles and references that point to real artifacts and known parallelisms between other historical sources and the Bible which makes reading the Old Testament an even more fulfilling experience. Let me make myself clear on this fun point, however. The reason Christ said we must all come to Him “as little children,” doesn’t mean that you have to believe in Him before you become an adult. It means that believing in God and what He says is like having the open-mindedness and trust that only children can give us the purest examples of. No amount of scientific or historic evidence can change the reality of faith in Christ. He is Who He says He is. He does what He says He will do. Period. What is even more fun about these connections is when God opens them up to you Himself. For example, my Bible reading includes a little bit of Old Testament and then a little bit of New Testament. Right now, I am still making it through my Old Testament in the order it is published in my Archaeological Bible. But, having long since made it through the New Testament in my copy of that Bible, I am now reading the New Testament in my Ryrie NASB study bible, not in the order it was printed, but in the order the scholars think the books were actually written. So, while I am making my way through Lamentations in the OT, I am reading Romans in the NT. The Lamenter, having survived a punishment brought about by God through the Babylonians because God’s people had turned so far from Him, He had no other choice in calling them back to Him, asks the question: “wouldn’t the Lord see our need for justice?” Generations later, Paul, writing to a group of newly-formed Christians, mostly non-Jews, answers with a resounding “Yes!” The Lord has indeed seen our need for justification, and He has given it to us in the only way we sinners can hope to achieve it–as a gift of GRACE through the sacrifice Christ made for each of us on the cross. Reading these two passages in close proximity to each other, I was struck at how the members of Paul’s audience who may have been very acquainted with the passages from Lamentations would have heard his teachings on justification through grace with eyes so different from my own. I know I have sinned and fallen short of God’s glory, but I don’t have stories told me at my father’s knee, passed down generationally, about whole civilizations of my people who paid the price for continued disobedience in ways that would keep me up at night if I took the time to dwell upon them. How much more wonderful did the promise of Christ’s gift to us sound to those ears? My Old Testament view gave me the goosebumps as I read Romans this week. Now, there’s a fun reason to open the front half of your favorite book! And one more P.S. on the subject of finding fun aspects to things you might not feel like doing. I began this post with the notes I had jotted down earlier in the week when this idea came to me, but I really didn’t feel like writing today. I had to say a quick prayer to have the willpower to begin my post. But, as I got to writing, I really started to enjoy exploring just why the OT is fun to read. I learned a few more reasons why myself, and if that’s the only reason this post got written according to His will, then that’s reason enough. Have a blessed week, full of smiles, family-time, prayer-time, and a little time in the Old Testament. See what gems of truth or delight you uncover. And if you have the time, share them with the rest of us. I, for one, am eager to hear about your time in God’s word. In a culture where even our favorite “good” guys often come with a bit of a dark side, it may be difficult to fathom (if you are younger) or remember (if you are older) the days when a hero could be so good, we used terms like “syrupy” or “wholesome” to describe them. But the 1960 Disney film, Pollyanna offers just such a hero. 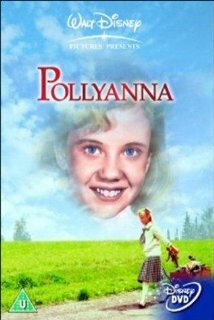 In fact, the young girl from this film who maintained a positive attitude in the face of all things to the contrary became so synonymous with the concept of goodness that those for whom goodness is an uncomfortable concept turned her name into an actual insult: “Don’t be such a Pollyanna,” they’ll say. And what they mean by that is that you are putting your head in the sand, ignoring reality, and being just, plain stupid. But Pollyannas are actually quite the opposite. In fact, Pollyanna is a forerunner of an idea that has been around since time began, but that cycles in and out of popularity, like so many things: the concept of CHOICE. For no matter where you turn in the pages of history, or even your Bible, those who find peace are those who master the ability to realize that we choose how the things that happen to us will actually affect us. By choosing positive, God-directed thoughts, we keep ourselves on the narrow way of Kingdom citizens. Let’s see how Pollyanna did it. As the story opens, Pollyanna has every reason to curl in the fetal position and hide in the attic room her aunt has stuck her in following the death of the young girl’s missionary parents. She could be angry that her aunt owns the town and yet sees her as a charity case. She could even be cowered by the servants who snarl at her and warn her not to get in the way. But Pollyanna has been raised to be made of sterner stuff. First, she introduces to anyone who will listen the “glad game,” a way of thinking her father had taught her when the missionary barrels brought crutches instead of dolls to play with. If any situation comes up that might make Pollyanna feel down, instead she looks for a way of thinking about the circumstances that could be a good thing. She CHOOSES to be glad. Guided by Pollyanna’s aunt, the local minister spews fire and brimstone from the pulpit each Sunday that leaves his congregation with a case of indigestion to last for the rest of the week! One day, as the preacher is alone at the top of a hill worrying himself over how little he seems to reach that congregation, up comes Pollyanna with a folded note to deliver from her aunt. As the preacher finds himself sharing his lamentations with the young girl, she has a bit more wisdom to impart from dear old dad. If you look for the evil in mankind, expecting to find it, she tells the preacher, you surely will. “Abraham Lincoln said that,” Pollyanna concludes. She goes on to explain that about the time her father found that quote, he had begun his study of what he called the “glad texts.” These were the verses where God instructed us to be happy, to find joy, to embrace love. Pollyanna tells the preacher there were 800 of them. “My dad said, ‘If God told us 800 times to be glad and rejoice, He must have wanted us to do it,'” she tells him. The next Sunday, the preacher has obviously done some thinking about choice. He delivers the happiest sermon of his career. And, he lets Pollyanna know there are actually 862 glad verses. He knew because he had spent the better part of the night before staying up to count them. Last week, I offered the roadmap to beginning your walk with Christ. With Christ in your life, you’ll soon discover that CHOOSING a Pollyanna world is more than possible, mainly because you are no longer facing the challenges of this world alone. The moment you accepted Christ as your Savior, repenting of the sinful life you have led, that we have all led, you were open for the entrance of the Holy Spirit, our Helper in this world to shine the light of Christ for those still in darkness. Each day, you are exposed to messages from television, the music you listen to, the billboards on the street. Many times, you don’t even have control over the messages that you are being bombarded with. But you do have the ability to CHOOSE which messages you will accept as truth. And you will have a growing understanding of God’s truth the more you study His word, communicate with fellow believers, and spend time in earnest prayer. Don’t forget, the devil has a real stake in making us believe the things that will keep us down, like “God can’t forgive me,” or “Nobody cares about me,” or “the Church will just judge me.” But God’s truth is about love and a believing community. Don’t let the devil make you confuse what feels good with what is good (but more on that another time). For today, embrace the “glad game.” Choose to see the light in your situation instead of the darkness. Pollyanna managed to affect her entire new community in a positive way. It may have been a typical Disney ending, but it’s an ending God gives us the right to CHOOSE. Just open your hand and reach for it. 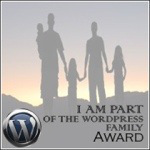 Thanks to one of my biggest encouragers in the WordPress community, Cathy, I am honored to be nominated for the Family Blog Award, which emphasizes the concept of community that proves blogging is more than just a passing fad. Longer ago than I care to remember, I studied anthropology as well as English at the university. For one graduate class, I was able to combine the two disciplines in a paper that used the theories on how cultures change espoused by anthropologist Frank Turner to analyze the poetry of my writing mentor, a great poet named Walt McDonald. One of Turner’s main principles about social change is that it begins on the outskirts of society, in what he calls the realm of anti-structure. In this environment of anti-structure, the outcasts exist on equal footing, actually finding more successful “solutions” to the “problems” in the conventional way of doing things. The bad news? Eventually, the anti-structure itself becomes structured, and the process begins again. We can apply this principle to the way Christ exacted change during His time on earth. He and the disciples definitely worked outside of the structured rules of the Pharisees. When Christ rose again, the early church continued this tradition. Remember the early monasteries, where the brothers shared all things equally? Eventually, though, these brotherhoods became institutions. Martin Luther, working on the outside of church thinking, sowed the seeds of the Reformation. The cycle began again. Now, I’m not saying that blogging on Christian faith will lead to a revolution in church thinking or doctrine, but I do look upon my blogging as a way to spread the word of what I pray the Holy Spirit has given me the skill and the insight to say. Reading the blogs of other writers on the subject of Christianity, I feel that I have found a community of believers out there who feel the same way. Some of you may be very active extroverts in your churches or communities. Many of you, like me, may be more introverted, tending to view the world from the edges, but still having so much to say that the outlet of blogging has been a real blessing. Does Jesus Have a Facebook Page? From biblical-based advice on living a more God-centered life to honest reflections on the challenges of daily living (including the ever-dreaded visit to Wal-Mart! ), this blogger means what she says and says what she means–and she takes the time to give others encouragement with personal comments, too! This blogger’s daily devotionals are deep, insightful and end with a great prayer to get you started on a God-filled day. I appreciate getting to read such good writing that is also obviously prayerfully considered. This young blogger has been given a real talent by God that she is openly struggling to find the best use for. Honestly, I see a lot of my own struggles in her posts. Some, I have overcome. Some, I still struggle with. But, it always helps to know that we are not alone in our feelings. I appreciate her honesty and openness. Encouragement in this writing life can come from many places. It might be awards like this one, where you get to take a moment and reflect on the fellow writers who have helped you grow your own skill. Or, it may come from stranger places. Flipping through radio channels this week in my car, I happened on a Glenn Beck interview. I don’t really know that much about Beck. I don’t keep up with politics. But in this interview, he was discussing a book he’s written. What struck me was that he spoke about the Holy Spirit as a kind of muscle that we need to exercise if we expect to be able to use it with any effectiveness. We can’t just let it lie dormant in us once we have accepted Christ and then expect it to work wonders when we’ve been walking around as if it weren’t even there. For a person who has been trying to grow her faith and lessen her fear, what a wonderful analogy to hear! God is so powerful. It was nice to be reminded (as I was heading to yoga to do some exercise for my body) that I need to keep up the work I have started of exercising my Spirit muscle as well. Blogging is one way I exercise that Spirit. What have you done for your Holy Spirit muscle lately? Thanks to all of you bloggers for the words that fill spaces you don’t even know exist each week in people’s lives. Let’s keep encouraging each other and strengthen our walk by faith. floating for decades in purest peace. between ourselves and a loving God. 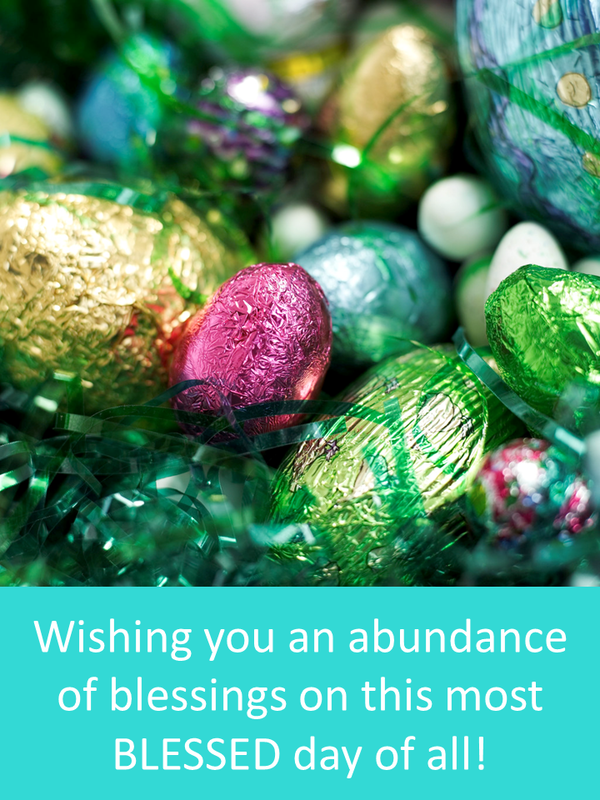 Christmas and Easter each have different reasons to bring about celebration. Why both of them are vitally important to us, I would argue that Easter’s reason edges out Christmas. And, yes, I know we actually couldn’t have one without the other. Still, here are the reasons that I think Easter gives us just a smidgen more to celebrate. On Christmas, we celebrate the fact that God loved us so much, He came to earth to live like one of us in the form of His Son, Jesus Christ. Some people have trouble with the concept of God in the form of the Trinity: Father, Son and Holy Spirit. I read recently a really interesting metaphor to help us understand this concept (sorry, I can’t remember where I read it to give full credit). Think about the sun and all the power and life it brings to our planet. The sun itself is visible in the sky. The rays that we can’t see give life to plants. We also feel the heat the sun provides on our skin. The Son and the Holy Spirit are functioning like the heat and UV rays of the sun as far as the relationship between all three are concerned. Like the sun and its physical properties, almighty God exists in the three forms we know as Father, Son and Holy Spirit. As Christ walked on this earth, He referred to Himself as the Son of God. He also told us that He would send the Holy Spirit to be with us when He no longer was physically walking the planet. God, despite what the deists or materialists might say, is in everything and about everything that we experience in this world, if we will just open our minds and hearts to let Him in. So why is Easter about so much more than bunny rabbits and chocolate eggs? Easter celebrates the triumph of Jesus, God-made-man, as the culmination of His walk on the earth sees fruition through His resurrection from the grave. If Christ had not allowed Himself to be taken prisoner by the Roman authorities,to be beaten and mocked by soldiers He could have called a legion of angels to defend Himself from, to be nailed to a cross to die an ignominious death, to have suffered the humiliation, pain, and torture of that death as a sacrifice for all of us, when He Himself was perfect and required no sacrifice on His own behalf, then there would be no hope for salvation for the rest of humanity. In order for the promise of Easter to be true, Christ has to be the divine living as a man, dying as a perfect man for the sins of all, rising as a triumphant God who has set all sinners who are willing to believe free, and making Himself continually accessible for those believers through the strength of His Holy Spirit made available through the gift of grace. Easter celebrates the faith that lets us believe without seeing. It celebrates the truth that the omnipotent God, whom no one can fully understand, makes Himself available to us in multiple, wondrous ways that open to us as easily as the plastic, pastel eggs that will hold prizes and candy on Sunday morning, as long as we open our arms in faith and believe. Yes, Christmas celebrates the miraculous birth of God-made-man. But Easter celebrates the awesome gift of grace that became available when that same man rose from the grave to offer salvation to all who believe. 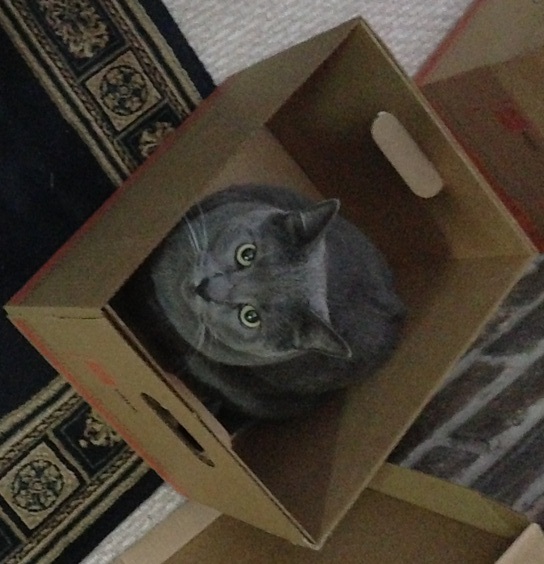 Have you accepted this gift of grace? Does your life reflect an Easter-every-day attitude? You don’t have to wait until this Sunday to accept the gift of grace and live the kind of love that spreads that gift to the rest of your world. In my life group, we’ve been looking at how the discoveries in science, including the Big Bang Theory, actually support the Biblical account of how the world came to be. Still, scientists want to deny that the Bible could be in any way factual. In fact, some of them stretch their theories beyond the realm of good science just to disprove the possibility that the Bible is right. But, any arguments about the validity of the Bible in connection with the understandings of the scientific mind miss the point entirely. Believing to the point of knowing is not a matter of mathematical equations or refined physics, but completely in the realm of faith. Faith is not something subject to the scientific method. It truly is beyond all understanding, and it is everything. Paul explains this truth in his first letter to the Corinthians: “For the word of the cross,” he writes, “is foolishness to those who are perishing, but to us who are being saved it is the power of God” (1:18). We are not going to know about the truth of Christ on the cross because we have scientific or archealogical proof. We have to take on faith the truth of our salvation through Christ’s sacrifice. “For since in the wisdom of God the world through its wisdom did not come to know God,” Paul continues, “God was well-pleased through the foolishness of the message preached to save those who believe” (1 Corinthians 1:21–bold added). We will not know God through our own knowledge or wisdom, but through our belief in a message that will seem foolish to those who want to rely solely on wisdom, on the things they can see, hear or touch. Faith doesn’t put us in a box, actually, but frees us to live life to the full, just as Christ wanted for us: “Now faith is the assurance of things hoped for, the conviction of things not seen” (Hebrews 11:1). Faith allows us to reach out to others without fear of being ridiculed. If we are ridiculed in the name of Christ, what is that to those who believe? Faith allows us to love unconditionally as we are loved by God. Faith gives us the patience to seek the daily practice that brings us ever closer to God and the fruit of the Spirit, that is love, joy, peace, patience, kindness, goodness, faithfulness, gentleness, and self-control (Galatians 5:22-23). While faith frees us, it also puts us in a box from which we cannot be shaken: “having also believed, you were sealed in Him with the Holy Spirit of promise” (Ephesians 1:13). Like the Nicole Nordemann song that asks, “What if you’re wrong, what if there’s more,” through faith we “jump, just close [our] eyes,” knowing that the “arms that catch [us], catch [us] by surprise” (What If?). No matter how you process information best (through hearing, seeing, or doing), faith, the great equalizer, brings us all to the same conclusion: there is a God who loved us enough to die for us. What a wonderful gift to open each morning, knowing that our stumbles are forgiven and that we can begin again.